Architectural Building Construction subject is strongly related to the Building Design, Physics, behavior of materials and communication of details to the building constructors. First semester aims at understanding process of construction technology of Architecture without Architects. The physical challenges, the abilities of building material, the role of each building element, the mode of communication for construction etc. was explored which are relevant to the building construction process. Learning was through building miniature models, experimentation with materials, report writing, drawing, discussion and lecturing. In this semester the assignments are mainly group based and the course is a mix of lectures, studio work assignments and site visits. 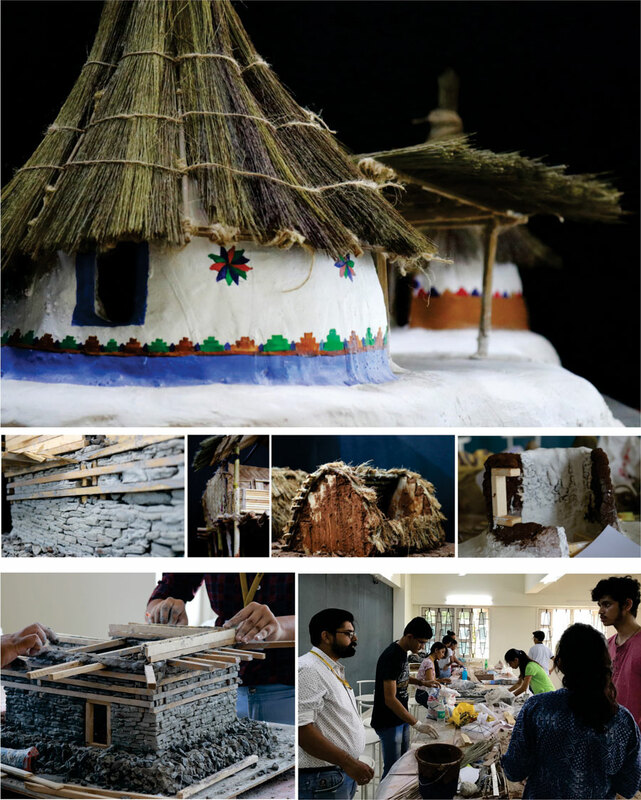 The objectives was accomplished by building a miniature model of a basic shelter (vernacular architecture) from various Geographical Regions of India namely Kath-Khuni house, Ladakhi house, Chettinad house, Bhunga house, Toda house and Assam house, students used representative materials and similar technology to build the models. Preparation of report on the relevant background of lifestyle – culture related facts which shape their architecture. Report and model may be assessed based on their understanding of the structural , material, and contextual understanding. Materials shape the spaces we inhabit and this project explores the role of building material as a generator of forms and volumes. 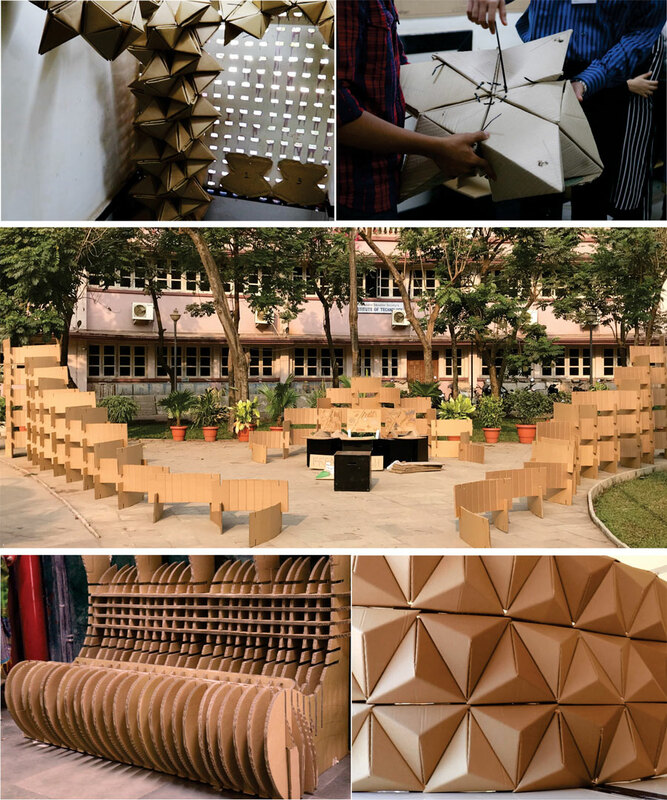 Student groups would explore Cardboard as a building material to build a temporary structure within the college campus. The design has to respond to the material in terms of Form, Fabrication, Modularity and the site in terms of function. The first stage was material exploration through miniature models to understand the characteristics and fabrication methods of cardboard. The 4 identified sites in the college campus was allotted to the groups and this stage would entail a detailed study of the features and activities on site. The design reflected the material understanding as well as the physical context of the site. 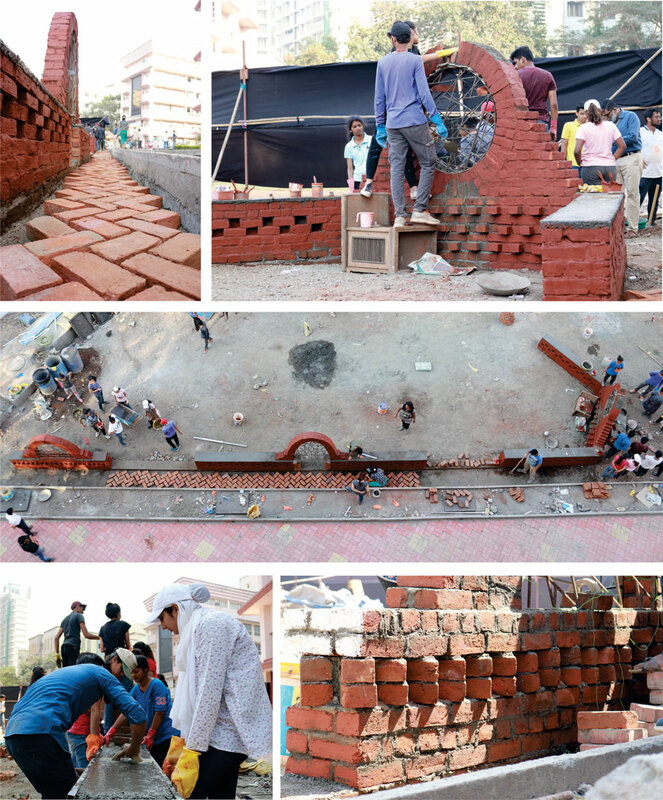 The final stage would include the erection of the design on site done by the student groups. Faculty:Prof. Anand Achari, Asso. Prof. Shruti Verma , Asst. 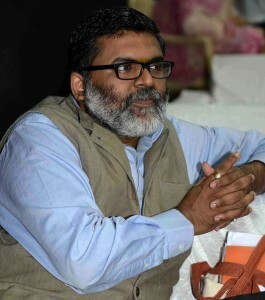 Prof. Ajit Nirmal, Asst. Prof. Rejish Ram, Prof. Om Merchant, Prof. Kiran Keluskar. Guest Faculty: Ar. AmeyMhatre. HOW DO YOU LEARN ARCHES AND MASONARY? VESCOA hands on workshop 9 was a maiden hands on exercise on the construction yard of VESCOA where the students had a chance to Design and Build various brick bonds and Arches in bricks in Three days. It helped students visualize and understand the structural system and also gave them an experience of handling bricks, masonry work and exposure to material behavior in live. Students were also introduced to on-site procedures like live leveling, plumb bob and skill of using construction tools. 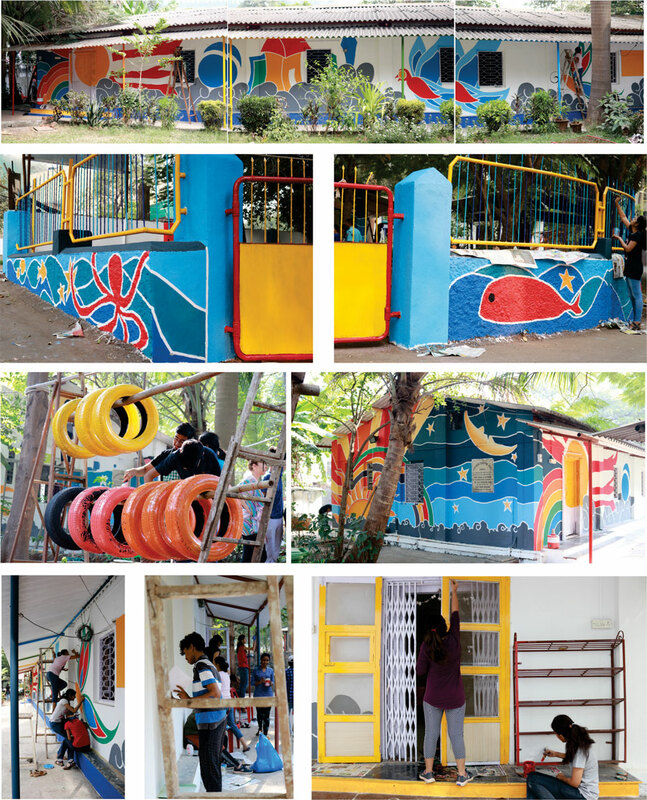 Play Spaces are basic necessity of all children in the world and an important step in developing abilities, skills and knowledge.The First Year B.Arch students of Vivekanand Education Society’s College of Architecture join hands to create Colorful, Joyful and Youthful spaces for children at VES Sunil KeswaniCreche and Day care centre, Chembur by Designing, Painting walls and Building installations with materials like Tyres, Ropes, Bamboos and Metal wires etc. 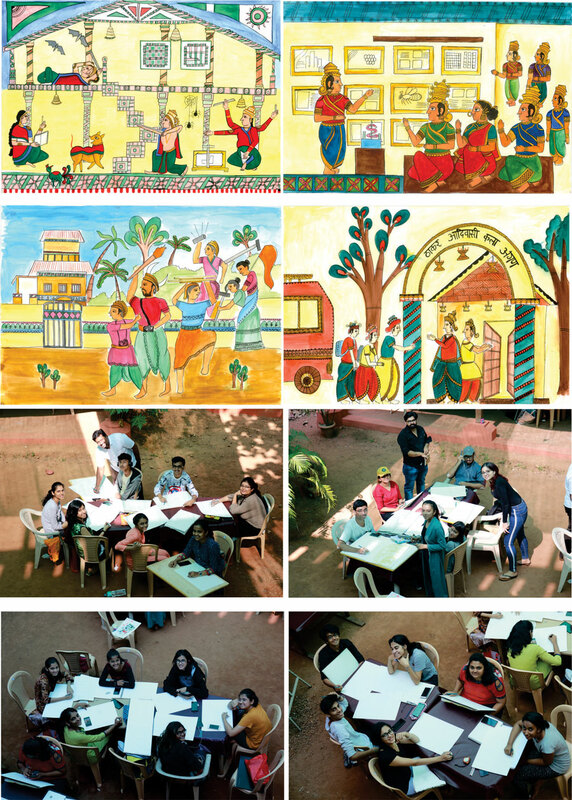 Students had a captivating experience with a live project, on site work and not to miss the fun of working in a team. Faculty:Prof. Anand Achari, Asso. Prof. Shruti Verma ,Asst. Prof. Ajit Nirmal, Asst. Prof. Rejish Ram. Guest Faculty: Dr. Martina Spies. Nature is a rich source of information on design, function, behavior and processes. There is a visuallayer of nature which can be seen and appreciated and there is an invisible yet active layer ofprocesses and behavior which keeps the natural system alive and functioning. The aim of this exercise was to understand the visual and invisible codes in nature. ‘Habitats’ deals withthe study of visual and functional characteristics of natural dwellings to understand their design and behavior within their biotic environment. The first stage of documentation was to gather information about the habitat they have been given through free hand sketches, photographs, videos, text etc. In the second stage, the habitat was analyzed on the following parameters: function, material, structure, elements, construction, form, texture and color. 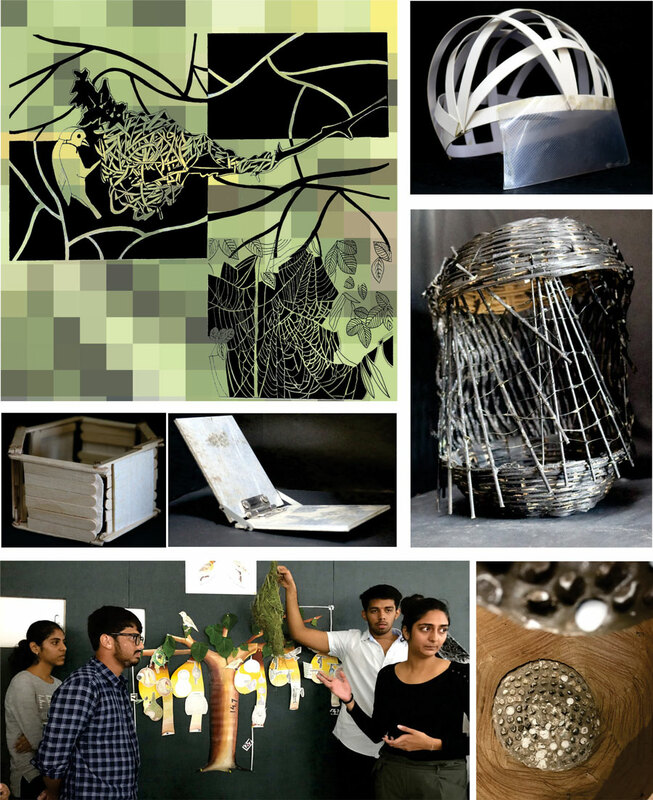 The analysiswascarried out through diagrams, sketches, form/structure models and compositions. In the final stage of abstraction, the essence of the characteristic features of the natural habitat are derived in order to be translated to a design. The Study trip to Kudal, Sawantwadi has kicked opened the doors of exploration through travel and documentation for the First yearites of VESCOA. The trip was an attempt to understand Konkan’s cultural landscape and its Vernacular Architecture. The Konkan belt is known for its unique geography of hills and coastal areas, its various art forms such as Chitrakathi and Ganjifa and its traditional architecture featuring sloping roofs, projecting balconies, mud/laterite construction and courtyard planning.A two day hands on activity with KONBAC helped the students to explore Bamboo as a construction material. Architectural drawings are a medium to represent ideas of a building’s design. There is a set ofarchitectural graphic tools and techniques used to represent architectural ideas that formuniversal drawing conventions, making these drawings legible across geographies and time. 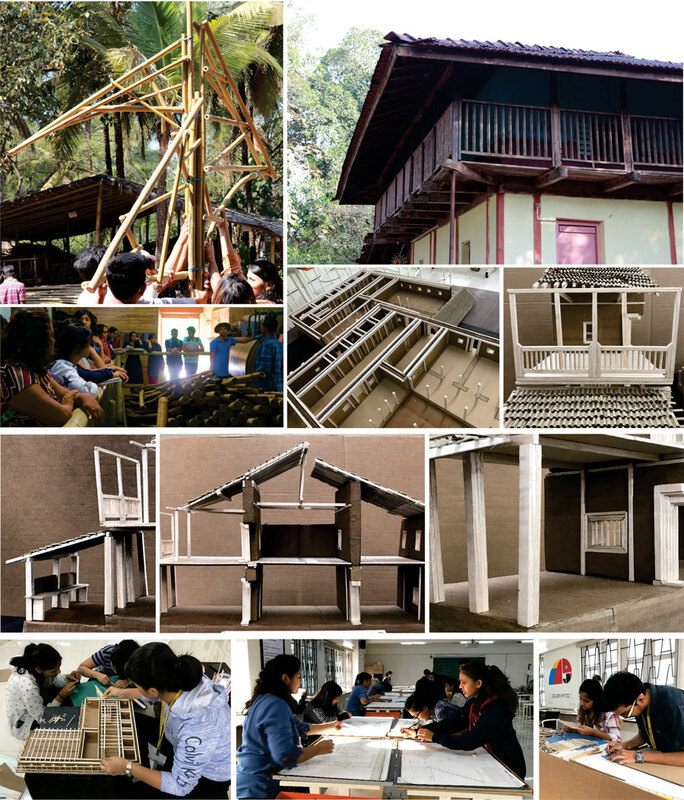 Thisproject aimed at rendering a local character to drawing conventions by the use of a traditional arttechnique – Chitrakathi, in the architectural representation of a vernacular house in Kudal,Konkan.